After losing the men's and women's titles to Ethiopia at Sunday's Paris Marathon, Kenyans will be out to reclaim their titles in Boston as the world's athletic focus shifts to the USA for Monday's 123rd running of the Boston Marathon. Despite a video message from Brazil's Paris St German striker Neymar wishing Paul Lonyangata success in Paris on Sunday, the two-time Kenyan champion failed to make it a hat-trick of victories in the race, finishing third in two hours, seven minutes and 28 seconds behind Ethiopians Abrha Milaw (2:07:04) and Asefa Mengistu (2:07:24). Former middle distance track star Gelete Burka made it an Ethiopian sweep, winning the women's race in 2:22:47 with Sally Chepyego (2:23:53) the top-placed Kenyan in fifth place. After Geoffrey Kirui and Edna Kiplagat made it a Kenyan sweep in 2017, last year's Boston Marathon saw the Kenyan dominance interrupted with Japan's Yuki Kawauchi (2:15:58) and Des Linden (2:39: 54) taking the men's and women's titles. Kirui finished second in 2:18:28 in terrible, rainy weather and will be hoping to reclaim the title in Sunday's race that starts at 4pm (Kenyan time). Locally, Bank of Africa will launch its 2019 "Viewerthon" series with the live airing of the Boston Marathon at Stevenice Hydepark Hotel in Kapsabet town. The "BOA Viewerthons" provide a forum for the bank's customers, elite and upcoming athletes and local athletic fans to interact as they support the marathoners. 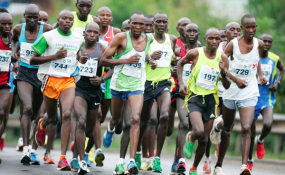 The "BOA Viewerthons" - that celebrate the five races of the World Marathon Majors - will also feature the London Marathon on April 28 along with the Berlin, Chicago and New York marathons at various locations in the North Rift towns of Kapsabet, Eldoret and Iten. BOA will also offer free lunch for the first 200 athletes who register for Monday's viewerthon in Kapsabet where the Kenya Revenue Authority will also offer education on customs, taxation and tax returns, among other subjects, to the athletes. "This is the sixth year we are sponsoring the Viewerthon series as part of our commitment to support a Kenyan heritage that is world class athletics. To this end we will identify upcoming athletes who we can sponsor to various marathons across the country and the world," Bank of Africa's Head of Marketing, Jimmi Wanjohi, said in a statement on Sunday. "BOA offers a distinctive package for sportsmen and women through its 'Mwanariadha Account, Asset Finance, mobile and internet banking equipping athletes with an avenue to achieve their financial goals." Apart from Kirui and Kiplagat, the other strong contenders in the men's race including Lawrence Cherono, Kenneth Kipkemoi, Felix Kandie, Festus Talam, Wesley Korir and Benson Kipruto. Kiplagat will lead Kenya's female elite line up as she attempts to put the 2018 debacle behind her and relive her 2017 victory. Other strong contenders in the women's race are previous winners Sharon Cherop, Caroline Rotich along with last year's Paris Marathon champion Betsy Saina and new comer Mary Wacera who has graduated to the full marathon with great potential.